Recombinant monoclonal antibody to DARC. Manufactured using AbAb’s Recombinant Platform with variable regions (i.e. specificity) from the hybridoma 2C3. Immunogen: CHO cells transfected with cDNA encoding the Duffy glycoprotein. Specificity: The antibody binds specifcally to the pentapeptide FEDVW of the Duffy receptor. Application Notes: The antibody binds to DARC, a glycoprotein chemokine receptor and the only known receptor for Plasmodium vivax. Note on publication: Describes the characterization of of the 2C3-epitope and how the antibody inhibits interleukin-8 binding to the Duffy receptor. WB on human liver lysate using Ab00893-23.0. 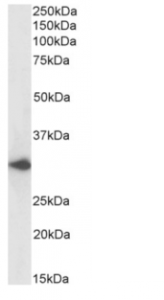 Western Blot using anti-DARC antibody 2C3 (Ab00893) Human liver lysate samples (35µg protein in RIPA buffer) were resolved on a 10% SDS PAGE gel and blots probed with the chimeric rabbit version of 2C3 (Ab00893-23.0) at 0.03 µg/ml before detection using an anti-rabbit secondary antibody. A primary incubation of 1h was used and protein was detected by chemiluminescence. The expected running size for DARC is 35.6kDa. Ab00893-23.0 successfully detected DARC in human liver lysate. 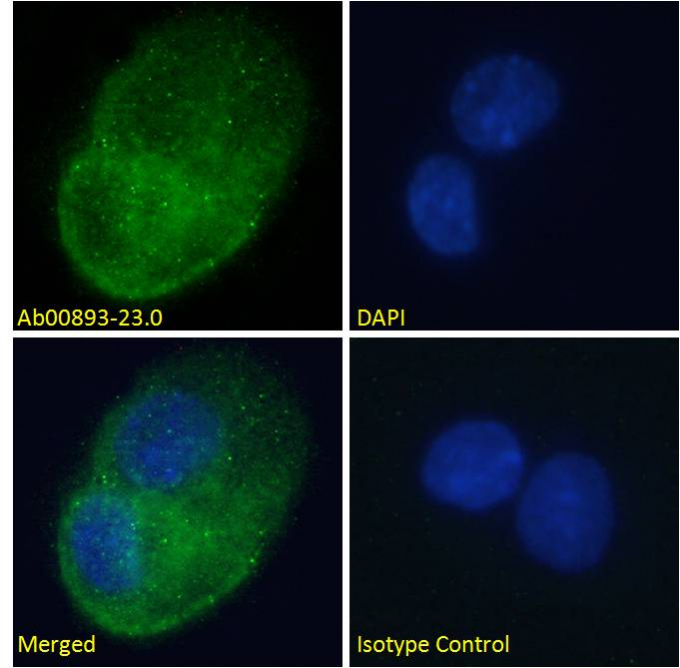 IF staining of HepG2 cells using Ab00893-23.0. 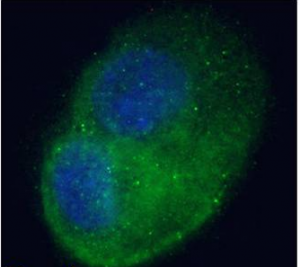 Immunofluorescence staining of fixed HepG2 cells with anti-DARC antibody 2C3 (Ab00893) Immunofluorescence analysis of paraformaldehyde fixed HepG2 cells on Shi-fix™ coverslips, permeabilized with 0.15% Triton and stained with the chimeric rabbit IgG version of 2C3 (Ab00893-23.0) at 10 µg/ml for 1h followed by Alexa Fluor® 488 secondary antibody (1 µg/ml), showing cytoplasmic staining, likely of endosomes, and some membrane staining. The nuclear stain is DAPI (blue). Panels show from left-right, top-bottom Ab00893-23.0, DAPI, merged channels and an isotype control. The isotype control was stained with an anti-Fluorescein antibody (Ab102-23.0) followed by Alexa Fluor® 488 secondary antibody.